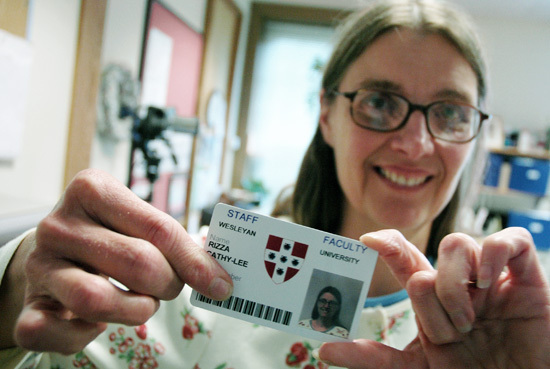 Cathy-Lee Rizza, WesCard coordinator, creates and programs all student, faculty, staff and special-occasion identification cards for the university. Thats a phrase Cathy-Lee Rizza may say a dozen times a day in Wesleyans WesCard Office. As WesCard coordinator, she creates Wesleyans faculty, staff and student ID cards and manages the information provided by ID holders. When a new student, staff or faculty requests a card, Rizza takes his or her photo, digitally places it into the proper template, inserts the persons ID number and information, and adds in a meal plan, a Middletown Cash account and security access information as needed. The photography part is her favorite. Everything is stored on  or inside the card, Rizza explains. WesCards are smart ID cards. The card contains a flexible printed circuit with a microprocessor and memory circuit. Among other data are embed security information which allows cardholders access to certain buildings, such as student residences or the Freeman Athletic Center. Along with a photo and the holders name, the front of the card has a barcode, which contains information such as a students Wesleyan ID number and issue number. This is the same code used to check out material at Wesleyans libraries. The cards backside has a magnetic strip that contains students campus meal plan information. Its also separately encoded with information that allows users to create a cash pool for the Middletown Cash Program, for use at participating on-campus and off-campus merchants. Card holders can make deposits on their card with a credit card, check their balances or freeze their card if it is lost through a Web site Rizza helped initiate, https://onecard.wesleyan.edu. Rizza is the sites co-webmaster and adds new information about the card frequently. Rizzas busiest time of the year occurs during the first two weeks of each semester when students need new cards, or need to change their meal plans. And for the next 13 weeks in comes a never-ending stream of students who have lost their IDs, she says. Ive had some students who I would see standing in line for the fourth or fifth time and I would get the paper work started on them ahead of time, because I just knew what they were back for. But then last week I had a graduate student come in, and for all those years he kept the same card. I told him I was so proud of him, Rizza says, smiling. Replacement cards arent free, and when Rizza isnt making cards, shes busy billing student accounts. She also deposits funds into WesCard accounts and makes sure Middletown Cash transactions are correctly deposited using a program called Blackboard Commerce Suite. As the systems operation administrator, Rizza often answers questions, solves technical issues and troubleshoot problems related to the software or communication lines. She also serves as the contact person to the software and hardware companies. Theres a lot more going on in this office than just creating WesCards, she says. Rizzas ties to Wesleyan date back to 1979 when she worked as an office assistant for Wesleyans former food contracting service, Saga. In 1989, Wesleyan began their contract with Aramark. Rizza stayed with the food companies until 2004, she was offered the WesCard coordinator position, doing similar computing operations, where she seamlessly converted the previous meal plan system into the Blackboard Transaction System. Rizza, a native of Cromwell, Conn. and 32-year resident of Middletown, is married to Joe Rizza. They have one son, Joe Jr., and one dog and two cats. Cathy-Lee Rizza enjoys gardening, cooking, cross word puzzles and managing her lifestyle change. Since August 2005, Rizza has dropped more than 100 pounds through Weight Watchers.